Sewing classes and workshops are a great way to relax and learn a new skill, for adults and children. Local Mums recommend the best ones in our area. 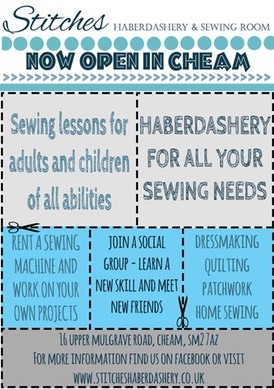 "I highly recommend�Stitches Haberdashery�to all Local Mums. We had a fantastic party for my daughter Bethan; she tells me this was the best party ever!" Stitches is a quiet haven within a bustling community that combines teaching crafts with a haberdashery. It is a place where you can come with a project you are working on and rent a sewing machine by the hour, seek advice or just browse the beautiful fabrics for inspiration. The Haberdashery is well stocked for all your crafting and sewing needs. We have an extensive range of classes from beginners level up to dressmaking and specialist crafts. New courses and events will be added all the time, so sign up for the newsletter to receive the most up to date booking information. Whatever your fancy dress needs, we can create a bespoke solution. Prices start from �10 for individual pieces upwards for complete outfits.